Pennsylvania has a lot of great waterfalls, but Dry Run Falls located in Sullivan County’s Loyalsock State Forest has to be one of the best. 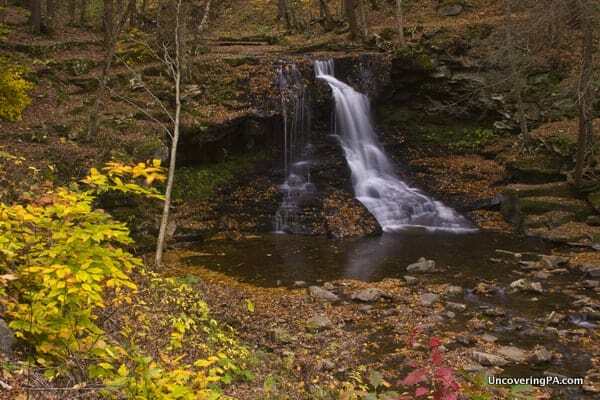 In fact, it’s one of the few waterfalls in Pennsylvania that I made a point of visiting a second time. It’s just that spectacular. Don’t let the name fool you. Just like Iceland isn’t really icy and Greenland isn’t all that green, Dry Run Falls typically has a nice flow of water going over the edge. That being said, as with most waterfalls, the best time to visit is after a bit of rain, especially in the spring or autumn months. The sun sets over Dry Run Falls. Dry Run Falls is roughly 20 feet tall and generally features two streams of falling water separated by a bit of rock that juts out from the middle. This gives the waterfall a lot of character since the two steams come down at a sharp angle to each other. Another thing I love about visiting Dry Run Falls is how easy it is to get to. 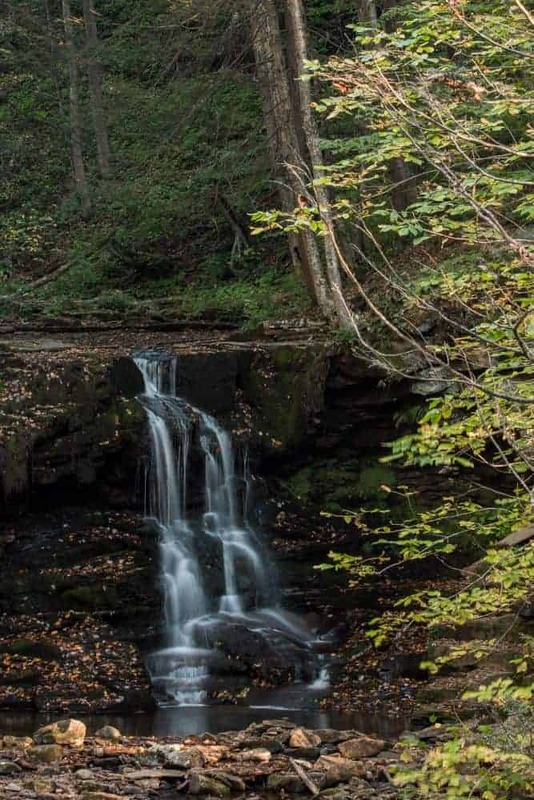 Located just steps from a parking area and a few picnic tables, Dry Run Falls is a great waterfall for those who can’t hike, because the waterfall can be seen from the road and parking area. Overlooking Dry Run Falls, only steps from the parking area. Even if you can’t hike, this waterfall can be easily seen. For those looking for a closer look, a small, steep path leads to the bottom of the falls. From the bottom, Dry Run Falls is even more impressive than it is from the parking area. Because of the unique rock formations, walking around the base of the waterfall gives a slightly different look to the waterfall. However, I think Dry Run Falls looks best from straight on at the bottom of the falls. 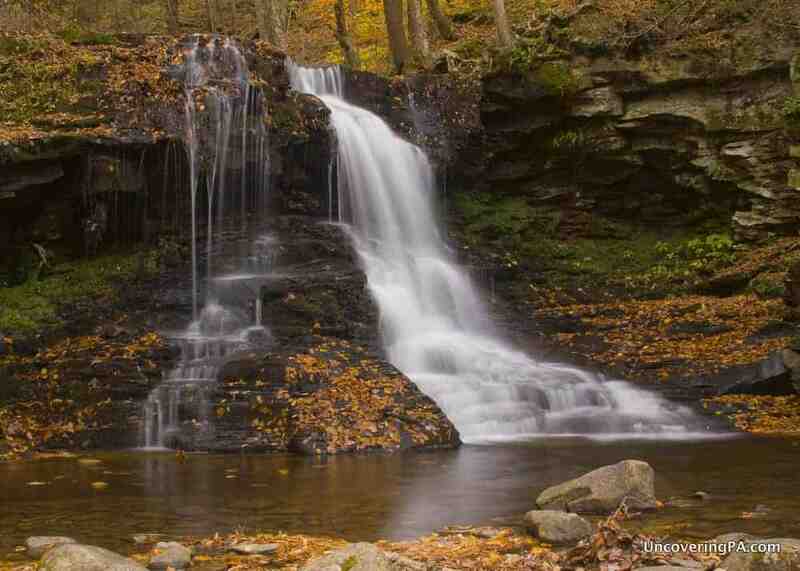 Dry Run Falls during fall in Pennsylvania. Getting to the top of the waterfall is also quite easy as it’s a flat, 50-foot walk from the parking area. If you venture near the top of the waterfall, use extreme caution as the rocks near the edge are incredibly slippery, and a fall down to the rocks below would certainly be quite dangerous. 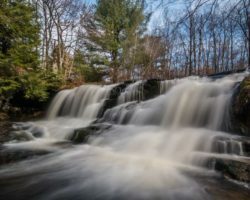 Further upstream from Dry Run Falls are two small cascades that might be of interest to photographers or those simply looking for a beautiful sight. The first small cascade on Dry Run is only about 3-feet tall, but quite scenic. 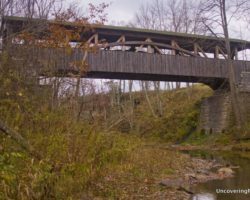 The first is about 150 feet upstream of the falls and is right under the small bridge that carries Dry Run Road over the water. The second, which is somewhat more beautiful, though more difficult to get a close look at, is about 100 yards up Dry Run Road, under the next small bridge up the hill. 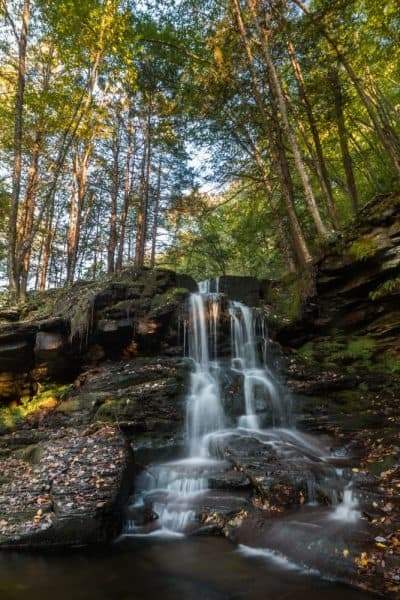 While neither of these three to four-foot cascades is worth the trip by themselves, they are a nice addition to one of the best waterfalls in Pennsylvania. Looking down at Dry Run Falls from near the parking area. Dry Run Falls is located roughly two miles from Route 87 along Dry Run Road in Loyalsock State Forest in Sullivan County, Pennsylvania. 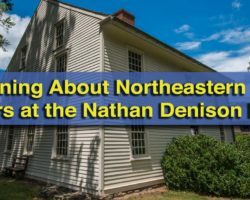 When you turn onto Dry Run Road from Route 87, you’ll quickly pass the park office on your right. 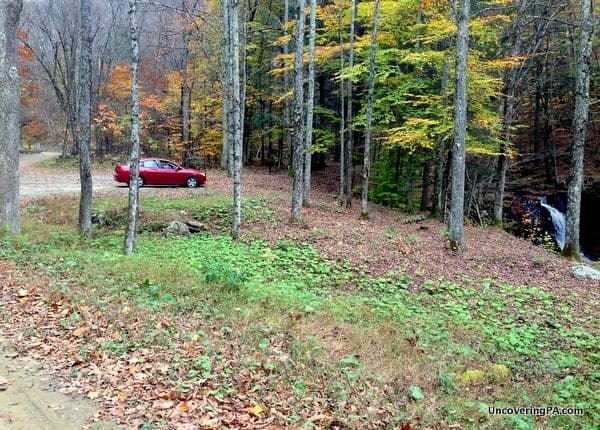 As you keep driving, the road turns from asphalt to gravel about halfway to the falls. You’ll also pass a picnic area with a pavilion, but this isn’t where the falls are. Keep going. At the two-mile mark, the falls will be quite difficult to miss on your right as you can see them very well from the road. There is a parking area big enough for half dozen or so cars and a couple of picnic tables if you are looking for somewhere to have lunch. The parking area for Dry Run Falls from the middle of Dry Run Road. 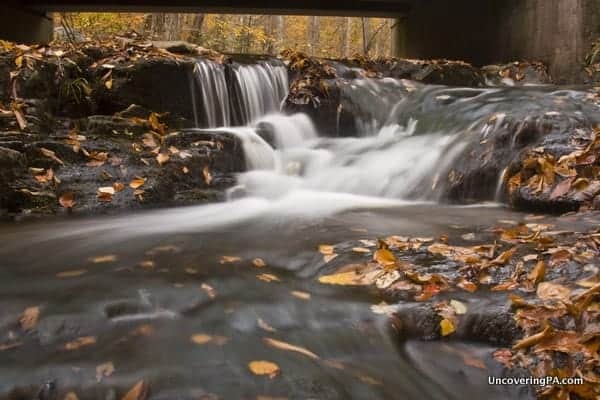 Check out the map below for the exact location of the waterfall, or put these coordinates in your favorite GPS unit to help you find your way: 41.430211, -76.670623. Looking for more great waterfalls? 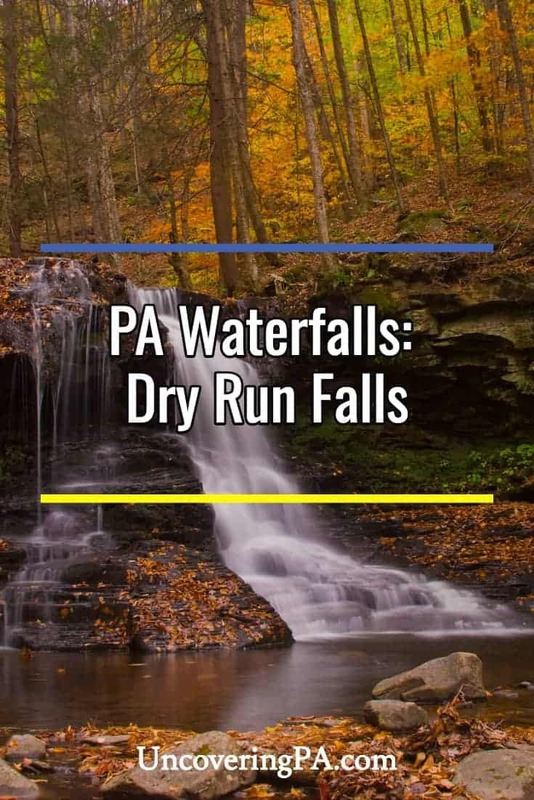 Click the link to check out all of the beautiful Pennsylvania waterfalls that are pictured on the site. 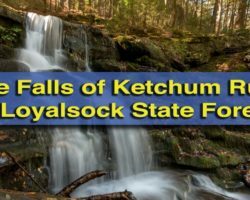 Or, check out other waterfalls in the area like the falls of Ketchum Run, Angel Falls, and Dutchman Falls. 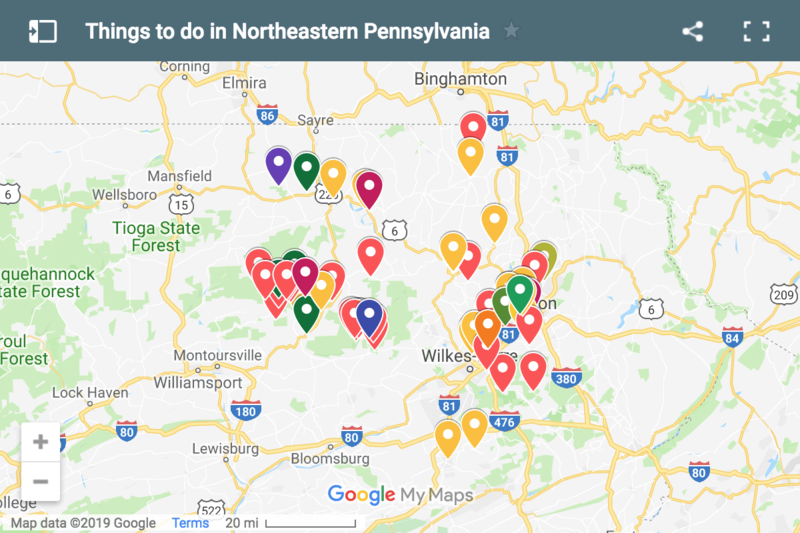 You can also see our top suggestions for things to do in Loyalsock State Forest. Would this be safe to do a waterfall shoot with the models from my magazine? tyia! beatuiful pics! This place looks so beautiful! Also, about how far do you have to walk/hike to a “safe” falls if there is one for my photoshoot? This waterfall is roadside, so it’s definitely accessible. The trail to the bottom can be a bit tricky though. Hi Jim, my family and I will be renting in Lake Naomi in a few weeks. 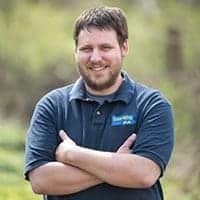 I am in my 70’s and can’t walk very far, but I love waterfalls and would love to go to any accessible ones within a half hour or so of LAKE NAOMI. Any suggestions? Looking forward to your reply. Thanks so much. 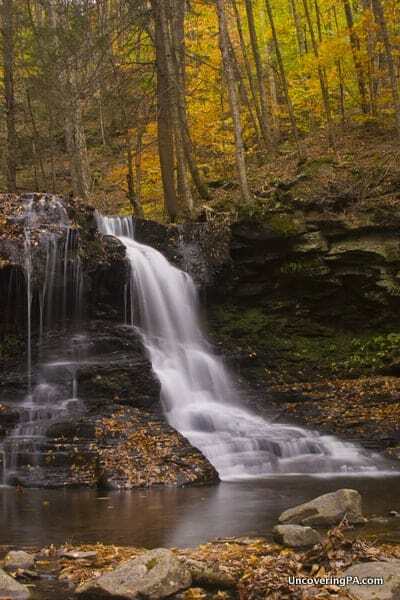 Check out Buttermilk Falls near Wilkes-Barre, Buttermilk and Luke’s Falls in Lehigh Gorge State Park, and Tobyhanna Falls. 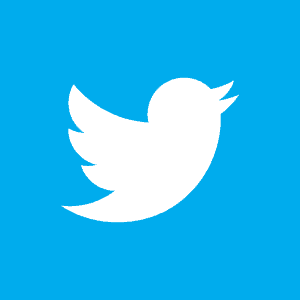 All are fairly easy to reach.